Before installing Weave Net, you should make sure the following ports are not blocked by your firewall: TCP 6783 and UDP 6783/6784. For more details, see the FAQ. Note: This command requires Kubernetes 1.4 or later, and we recommend your master node has at least two CPU cores. CNI, the Container Network Interface, is a proposed standard for configuring network interfaces for Linux containers. 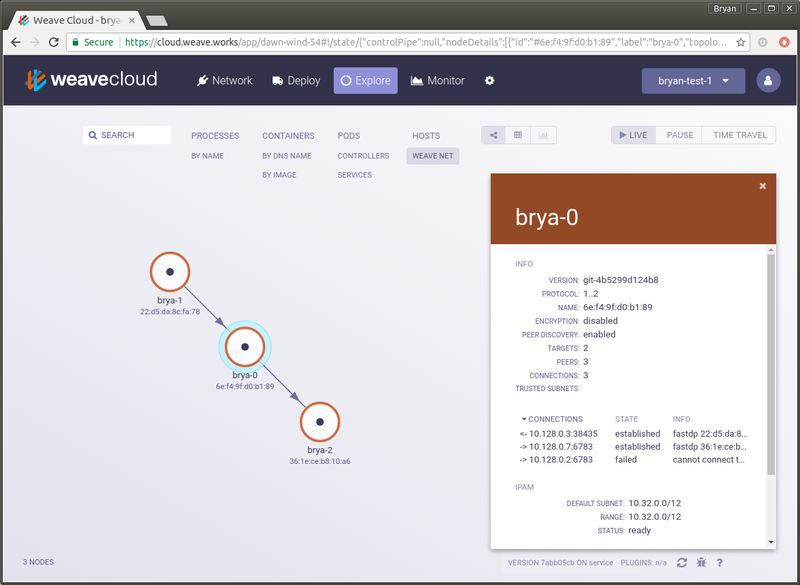 If you do not already have a CNI-enabled cluster, you can bootstrap one easily with kubeadm. Weave net depends on the portmap standard CNI plugin to support hostport functionality. Please ensure that portmap CNI plugin is installed (either by cluster installers like kubeadm or manually if you have configured CNI yourself) in /opt/cni/bin directory. Then relaunch Kubernetes and install the addon as described above. Note: Installing on GKE Please note that you must grant the user the ability to create roles in Kubernetes before launching Weave Net. This is a prerequisite to use use role-based access control on GKE. Please see the GKE instructions. The DaemonSet definition specifies Rolling Updates, so when you apply a new version Kubernetes will automatically restart the Weave Net pods one by one. Kubernetes manages resources on each node, and only schedules pods to run on nodes that have enough free resources. The components of a typical Kubernetes installation (with the master node running etcd, scheduler, api-server, etc.) take up about 95% of a CPU, which leaves little room to run anything else. For all of Weave Net’s features to work, it must run on every node, including the master. The best way to resolve this issue is to use machines with at least two CPU cores. However if you are installing Kubernetes and Weave Net for the first time, you may not be aware of this requirement. For this reason, Weave Net launches as a DaemonSet with a specification that reserves at least 1% CPU for each container. This enables Weave Net to start up seamlessly on a single-CPU node. Depending on the workload, Weave Net may need more than 1% of the CPU. The percentage set in the DaemonSet is the minimum and not a limit. This minimum setting allows Weave Net to take advantage of available CPU and “burst” above that limit if it needs to. If a node runs out of CPU, memory or disk, Kubernetes may decide to evict one or more pods. It may choose to evict the Weave Net pod, which will disrupt pod network operations. You can reduce the chance of eviction by changing the DaemonSet to have a much bigger request, and a limit of the same value. This causes Kubernetes to apply a “guaranteed” rather than a “burstable” policy. However a similar request for disk space can not be made, and so please be aware of this issue and monitor your resources to ensure that they stay below 100%. 1m         1         mypod-09vkd   Pod     Warning   Evicted    kubelet, node-1   The node was low on resource: memory. If you see this in your cluster, consider some of the above steps to reduce disruption. Weave Net provides a network to connect all pods together, implementing the Kubernetes model. Kubernetes uses the Container Network Interface (CNI) to join pods onto Weave Net. Kubernetes implements many network features itself on top of the pod network. This includes Services, Service Discovery via DNS and Ingress into the cluster. WeaveDNS is disabled when using the Kubernetes addon. Note: as of version 1.9 of Weave Net, the Network Policy Controller allows all multicast traffic. Since a single multicast address may be used by multiple pods, we cannot implement rules to isolate them individually. You can turn this behaviour off (block all multicast traffic) by adding --allow-mcast=false as an argument to weave-npc in the YAML configuration. Note: Since ingress traffic is masqueraded, it makes sense to use ipBlock selector in an ingress rule only when limiting access to a Service annotated with externalTrafficPolicy=Local or between Pods when podIP is used to access a Pod. The first thing to check is whether Weave Net is up and running. The kubectl apply command you used to install it only requests that it be downloaded and started; if anything goes wrong at startup, those details will only be visible in the logs of the container(s). You should see one line for each node in your cluster; each line should have STATUS “Running”, and READY should be 2 out of 2. If you see a STATUS like “Error” or “CrashLoopBackoff”, look in the logs of the container with that status. For easier viewing, pipe the output into a file, especially if it is long. By default log level of weave container is set to info level. If you wish to see more detailed logs you can set the desired log level for the --log-level flag through the EXTRA_ARGS environment variable for the weave container in the weave-net daemon set. Add environment variable as below. You may also set the --log-level flag to warning or error if you prefer to only log exceptional conditions. Many Kubernetes network issues occur at a higher level than Weave Net. The [Kubernetes Service Debugging Guide] (https://kubernetes.io/docs/tasks/debug-application-cluster/debug-service/) has a detailed step-by-step guide. The above shows all Weave Net pods available in your cluster. You can see Kubernetes has deployed one Weave Net pod per host, in order to interconnect all hosts. 3. Finally you could also use Weave Cloud and monitor all your pods, including Weave Net’s ones, from there. For more information see What is Weave Cloud? If you suspect that legitimate traffic is being blocked by the Weave Network Policy Controller, the first thing to do is check the weave-npc container’s logs. TCP connection from 10.32.0.7:56648 to 10.32.0.11:80 blocked by Weave NPC. UDP connection from 10.32.0.7:56648 to 10.32.0.11:80 blocked by Weave NPC. Don’t turn on --masquerade-all on kube-proxy: this will change the source address of every pod-to-pod conversation which will make it impossible to correctly enforce network policies that restrict which pods can talk. If you do set the --cluster-cidr option on kube-proxy, make sure it matches the IPALLOC_RANGE given to Weave Net (see below). IP forwarding must be enabled on each node, in order for pods to access Kubernetes services or other IP addresses on another network. Check this with sysctl net.ipv4.ip_forward; the result should be 1. (Be aware that there can be security implications of enabling IP forwarding). Weave Net can be run on minikube v0.28 or later with the default CNI config shipped with minikube being disabled. See #3124 for more details. version: Weave Net’s version. Default: latest, i.e. latest release. N.B. : This only changes the specified version inside the generated YAML file, it does not ensure that the rest of the YAML is compatible with that version. To freeze the YAML version save a copy of the YAML file from the release page and use that copy instead of downloading it each time from cloud.weave.works. $ kubectl apply -f "https://cloud.weave.works/k8s/net?k8s-version=$(kubectl version | base64 | tr -d '\n')&password-secret=weave-passwd"
known-peers: comma-separated list of hosts. Default: empty. trusted-subnets: comma-separated list of CIDRs. Default: empty. disable-npc: boolean (true|false). Default: false. env.NAME=VALUE: add environment variable NAME and set it to VALUE. CONN_LIMIT - soft limit on the number of connections between peers. Defaults to 100. HAIRPIN_MODE - Weave Net defaults to enabling hairpin on the bridge side of the veth pair for containers attached. If you need to disable hairpin, e.g. your kernel is one of those that can panic if hairpin is enabled, then you can disable it by setting HAIRPIN_MODE=false. WEAVE_EXPOSE_IP - set the IP address used as a gateway from the Weave network to the host network - this is useful if you are configuring the addon as a static pod. WEAVE_MTU - Weave Net defaults to 1376 bytes, but you can set a smaller size if your underlying network has a tighter limit, or set a larger size for better performance if your network supports jumbo frames - see here for more details. NO_MASQ_LOCAL - set to 1 to preserve the client source IP address when accessing Service annotated with service.spec.externalTrafficPolicy=Local. The feature works only with Weave IPAM (default). $ kubectl apply -f "https://cloud.weave.works/k8s/net?k8s-version=$(kubectl version | base64 | tr -d '\n')&env.WEAVE_MTU=1337"
$ curl -fsSLo weave-daemonset.yaml "https://cloud.weave.works/k8s/net?k8s-version=$(kubectl version | base64 | tr -d '\n')"
Whether you saved the YAML file served from cloud.weave.works or downloaded a static YAML file from our releases page, you can manually edit it to suit your needs.